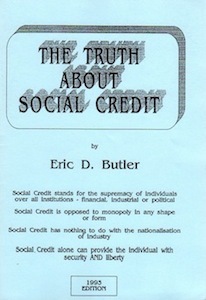 “The Truth About Social Credit” deals with the significance of the Curtin Government’s 1945 Banking Legislation, which some falsely claimed as a manifestation of Social Credit, as one of the first post-war steps to internationalize the nation’s banking system. The history of the past 50 years, and the current world crisis, affecting all nations, have increasingly confirmed my view that Social Credit offers the only hope of averting the eventual disintegration of yet another civilization. Social Credit stands for the supremacy of individuals over all institutions – financial, industrial or political; opposes the monopoly in any shape or form; has nothing to do with the nationalization of industry; and alone can provide the individual with security and liberty.